Sometimes even the most fiercely guarded secrets are destined to be revealed. A native Virginian, Susan Coryell is a career educator and a lifelong writer. She has taught students from 7th grade through college-level and is listed in several volumes of Who’s Who in Education and Who’s Who in Teaching. A favorite activity is to talk with budding writers at schools, writers’ conferences, and workshops. Susan has always been interested in Southern culture and society, as hard-felt, long-held feelings battle with modern ideas. She was able to explore these concepts in her cozy mystery/Southern gothic A Red, Red Rose, whose fictional setting is based on Smith Mountain Lake, Virginia. The ghosts slipped in, to her surprise. When not writing, Susan enjoys boating, kayaking, golf and yoga. She and her husband love to travel, especially when grandchildren are involved. Welcome to the blog, Susan. How many books have you written? My first published novel, Eaglebait, a young adult work involving school bullies was published over twenty years ago. It won The International Reading Association’s “Young Adult Choice,” and the NY Public Library’s “Books for the Teen Age” awards. I have recently updated Eaglebait to include cyber-bullying and it is available in print and e-book via Amazon and Barnes and Noble. A Red, Red Rose is my second published book. Give a short synopsis of your most recent book. When twenty-year old Ashby Overton travels to Overhome Estate for a summer in Virginia, she hopes to unearth her ancestral roots and the cause of a mysterious family rift surrounding the death of her Grandmother Lenore years ago. From the moment she enters her room in the oldest wing, Ashby feels an invisible enfolding presence. She learns the room once belonged to a woman named Rosabelle, but no one is willing to talk about Rosabele—no one except Luke, the stable boy who captures Ashby’s heart. As Ashby and Luke become closer, she realizes he can be the confidant she needs to share the terrifying secrets unfolding. Ever present is a force Ashby never sees, only feels. Candles light themselves, notes from an old lullaby fall from the ceiling, the radio tunes itself each day. And roses appear in the unlikeliest places. Are the roses a symbol of love, or do they represent something dark, something deeply evil? Q: What challenges did you face while writing this book? I started writing A Red, Red Rose while living in Northern Virginia, the scene of an actual ancestral home reputed to be haunted. After retiring to Southern Virginia, I decided to switch the setting there. The problem was I had not lived there long enough to fully understand the cultural nuances. So, I fictionalized the setting as Moore Mountain Lake and made up whatever details I wanted. That’s the great thing about writing fiction! Q: Do you travel to do research or for inspiration. Share some special places. Research was key for the history background of A Red, Red Rose. Fortunately, Virginia is very big on history. I believe seven US presidents were born in the state and George Washington and Thomas Jefferson are sacred! I spent hours in the Bedford Museum, which specializes in local history. There I found my prototype for Overhome Estate, as well as information on the formation of Smith Mountain Lake. I talked to the historians at Booker T. Washington’s birthplace in regard to slave cemeteries and consulted professors about Civil War activity in Southern Virginia. Lots of work, but lots of fun and I met some fascinating folks. Q: What is your greatest lesson learned about writing so far. What advice do you have for new writers. Like most writers, I have to edit, edit, edit. I find putting my work aside for a day or so and re-reading it from a fresh point of view helpful. For new writers, I suggest joining a critique group. For writers of all ages, I say read constantly. Q: Promotion—how do you get the word out both off and online? Ah, promotion—my most dreaded aspect of being a published author. I work hard at what I call hands-on promotion. I’m good at holding signings, workshops, author talks and panel discussions. I enjoy speaking to any group who invites me—be it schools, book clubs, community organizations or church. It’s the online promotion I find most challenging. I have a good website, a pretty decent blog (which I need to write on more frequently), and I belong to Face Book, Linked In, She Writes, Goodreads, and my Authors Helping Authors publisher’s group. An English major through and through, I find technology baffling and frustrating, but I battle on. Just opened a Twitter account—so we’ll see how that works. Q: What are your future writing goals/projects?? I am so glad you asked! 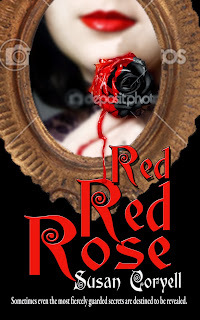 I have just finished the sequel to A Red, Red Rose and am editing, editing, editing until I muster the nerve to submit it to my publisher. Called Beneath the Stones, the cozy mystery/Southern gothic finds Ashby Overton five years later, mistress of the manor and planning her wedding when a big problem emerges. Of course, there are spirits involved and these ghosts originated during the Civil War. Talk about research! I have become quite the expert on Confederate history—visiting battlefields, museums and ancient houses—attending lectures, perusing books and scouring the Internet. It was a learning experience, for sure. Eaglebait is available at Amazon in print and as e-book for Kindle. It is also available for Nook. It will be offered FREE from Jan 21 – Jan 21 – Jan 25. Thanks for the opportunity to blog on this awesome blogspot and I hope to hear from lots of readers! I've just joined a book group at Good Reads. It's for book addicts, so I am a qualified member. I'll be posting some books I've read and hope to read and a review or two as well as my own writings. Join me anyone?